As promised in my last post, here's my chili recipe. But first, I'd like to share a little of its history. My little brother wasn't a fan of kidney beans in our growing up years. So, my Mom altered her recipe to accommodate his preferences. My sister and I still make our chili in the adjusted way. I brought this. And, it all went. Every. Single. Time. Hence the name it's been awarded ~ Crowd Pleasing Chili. And, just a word on adjustments ~ this recipe is very forgiving. Substitute your favourites in place of my suggestions. baked beans and ketchup and soaked and cooked my own kidney beans. I've sweetened the whole lot with honey. adjust to suit your own needs. Scramble fry the beef until nearly done and add in onions and peppers. Saute until meat is fully cooked and the onions are translucent. Add in all remaining ingredients, except salt, and bring to a boil. 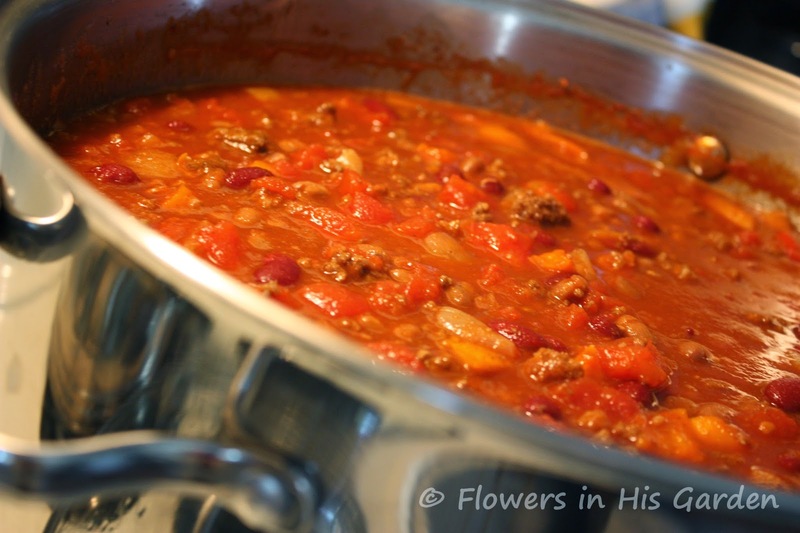 Reduce heat and simmer (partially covered) for 1.5 to 2 hours in order to blend flavours. If it's still a bit runny at this point, remove the lid completely and simmer it down. Stir in sea salt, remove bay leaves, and adjust seasonings to taste. and cornbread on the side. This makes enough to feed about twelve hungry tummies. I like to make lots to have some left over to freeze or to serve the next day. This will keep in the fridge for up to 3 days or for a few months in the freezer. Be sure to bring leftovers to a boil prior to serving. It sounds delicious. I never thought of using baked beans, my mouth is watering… gonna have to give it a try.